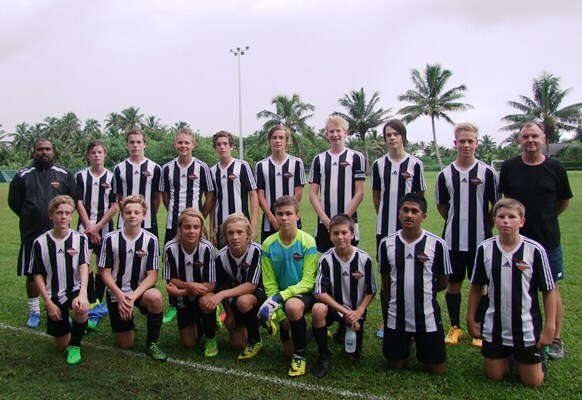 With supporters for both teams in the grandstand cheering, the CIFA U15 Boys beat Katikati College U15 Boys two goals to one on Easter Monday. In the first half both teams played an attacking game with Katikati College showing determination and securing a goal in the tenth minute of play. Katikati fought hard to keep the CIFA U15 Boys at bay. Twenty minutes into the game, Tangi Akava of the CIFA U15 boys blasted a beautiful goal and equalized one all. With minutes left in the first half Tangi Akava once again found the back of the net ending the first half two goals to one in favor of the CIFA U15 Boys. In the second half both teams continued to play a strong attacking game with relentless pressure on the defense of both teams. With several attempts at goal both teams were unable to find the back of the net. The match ended with the final score of two goals to one in favor of the CIFA U15 Boys Development team. In their second match, the Katikati College U15 Boys will play CIFA U15 Boys today at 4:45pm at the Takitumu School Field. A display of talent will be on show from the visiting team and also from the local youth teams.